When BBQ competitions roll around, I head to Willy's Butcher Shop in Knoxville to get our pork butts and wagyu brisket. They are also my go to place for other wagyu beef, dry aged steaks, craft sausages, and other high end meats. When we were picking up our competition stuff, Willy had some thick, great looking burgers made out of ground brisket. You know we had to buy some. 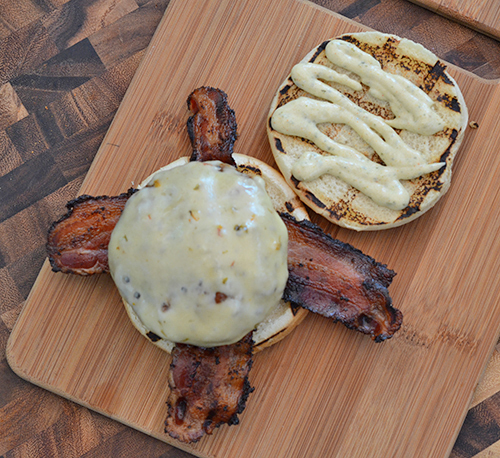 Custom beef blends for burgers has been a trend over the past few years. We learned about Chris Lilly's perfect burger blend at the inaugural Kingsford Invitational in 2012. It had brisket, oxtail, and short rib in it. We also covered custom beef blends at Grill Talk at the kitchens of Certified Angus Beef last year. Mike Vrobel of Dad Cooks Dinner and I went with ribeye, short rib, and sirloin flap (like skirt steak). Another good blend is brisket and flank steak. Notice that almost all of those have luscious, fatty beef mixed with leaner, beefy cuts. But here is Willy rocking the ground brisket burgers - 100% brisket. I was worried that they might be too fatty but these were crazy good. Because these burgers were extra thick and very cold (I had them in the Yeti with the competition meats for most of the day), I cooked them at a slightly lower temp and for longer. Normally I would just straight grill my burgers 4-5 minutes a side. Since these burgers are loaded with succulent fat, I used a bit of a bolder rub, spicy cheese, and that chile crema I posted a few days ago to balance out the flavor. Oh yeah, I also used some of our home cured and smoked bacon (pork belly from Willy's, of course). They were fantastic - the best we've had this year. Preheat your grill to medium heat (350-400°f) direct heat. 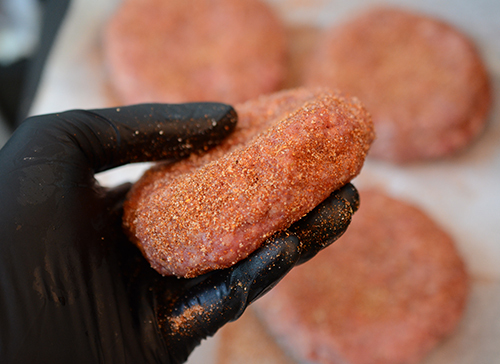 Mix together the dry rub ingredients and season the burgers all over. 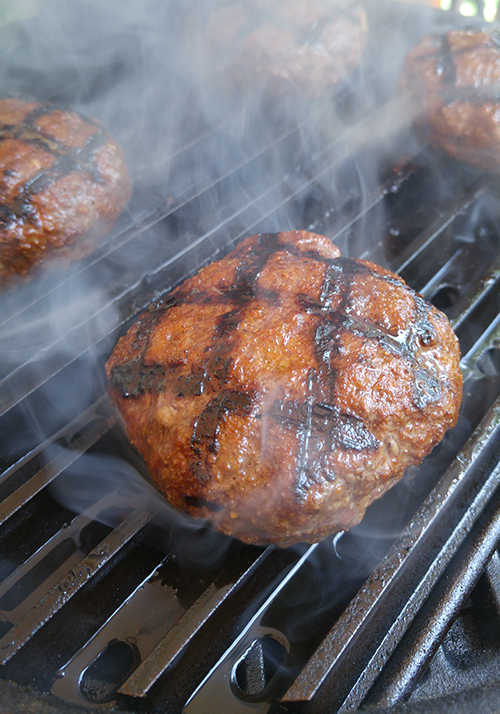 Sear the burgers for 5 minutes a side and then check your internal temperatures. 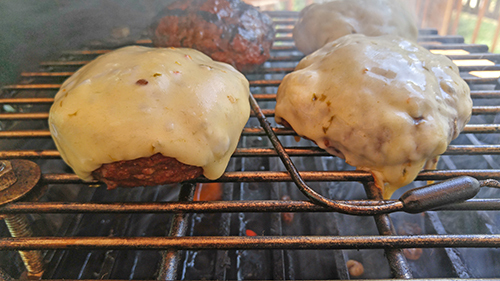 Move the burgers to indirect heat, top with cheese, close the lid and allow to finish cooking to your desired final temperature, about 5 minutes for medium. Serve with the crema drizzled on top. Finally bought a Kick Ash Basket for my Mini-Max. We originally got them for our large kamado grills just so we could take the coal out and cool them down quickly at BBQ contests. But now John and I pretty much use them whether competing or at home. 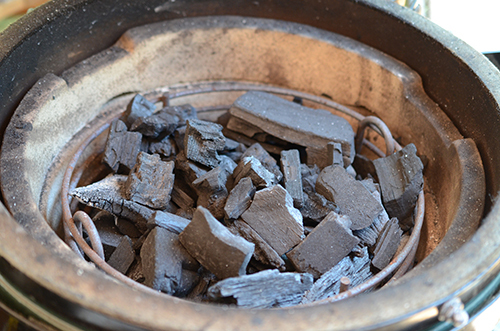 They aren't needed but they sure make reusing your leftover coal and clean up easier. I wanted a big bold flavors to balance the succulence of the burgers, so I went Southwestern. 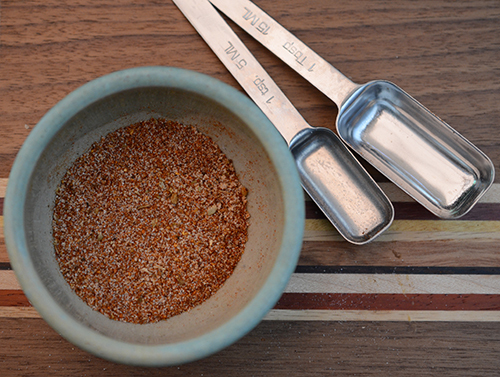 I used our fajita seasoning recipe but you can just buy one if you aren't so inclined. 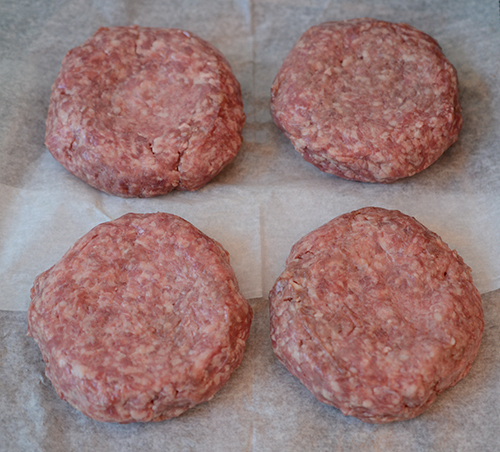 Willy's shrink wraps his burgers to keep them fresher, longer. This squeezes them in a bit so you need to flatten them back out a bit and put a dimple in the middle as shown. That will help keep them from drawing up with a bulge in the middle. Here's a tip I picked up from BBQ competition chicken - don't forget to season your sides because that is the first place the judge is going to bite. Same thing goes for burgers. We use our Mini-Max mostly for small, quick cooking things like burgers and steaks. 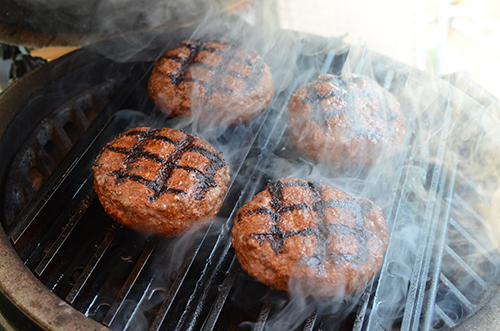 Yeah, the burger looks cool but look at how the rendered brisket fat coats those Grill Grates like a lacquer finish! 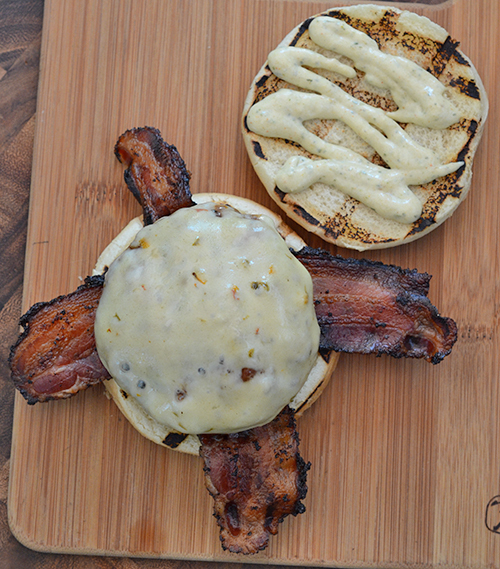 Is there anything better than grilled burgers on a sunny Saturday afternoon? 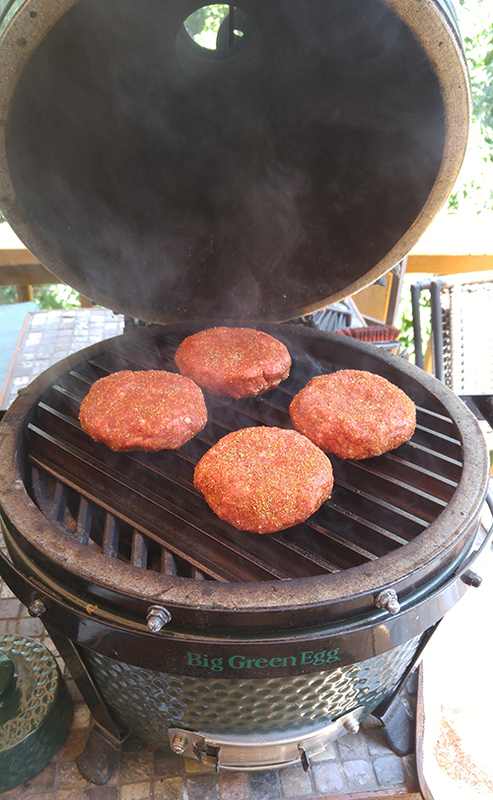 I put my homemade raised grate over the Grill Grates to let these burgers finish roasting to temp. Like I said, normally I would just straight grill them but these were not only extra thick, they were very, very cold. I love this burger because while it doesn't have a ton of toppings, it still has a LOT going on. So what is your favorite burger? Do you have a favorite blend or just like ground chuck/sirloin/round? Favorite toppings? [Standard FTC Disclaimer] I received no compensation for this post. I paid full price for my Mini-Max, Kick Ash Basket, and our meat from Willy's. I got the GrillGrates for free from Brad, but we have been fans of each other's work for several years since we met at Eggtoberfest in 2010.